We are always striving to provide the best possible tools and services – expanding into areas that will add value to your experience as a Z57 client. In the spirit of offering new learning solutions, we’re expanding our Academy to include the Z57 Academy Campus – a space for online learning that will be available to all Academy clients. Our Academy campus is designed to provide Academy students with additional resources and learning materials to help you stay motivated along your path to success. All content is presented in bite-sized portions and is available for you to access it anytime, anywhere. You can even take a class at 2am with your laptop on the couch as you lounge in your pajamas! 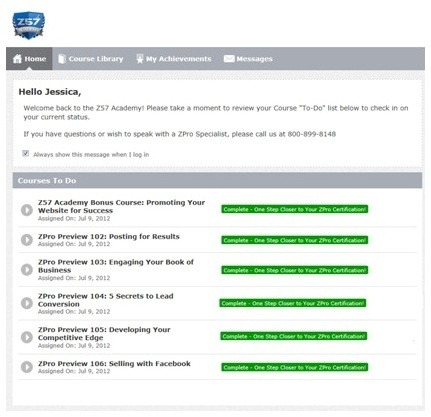 For those of you early on in the Academy, the campus content is designed to give you an overview of the next course you’ll be taking during your next appointment with your ZPro. For those of you who have graduated, this is a great opportunity for you to revisit the topics you covered in Academy and refresh and re-motivate yourself! You’ll notice a new tab within your Marketing Control Center titled “Academy”. Simply click on that tab to view your Academy Dashboard. Your dashboard provides you with a list of all the courses you have access to. If you are currently taking courses in the Z57 Academy 100 series, this list will be restricted based on where you are at in your coursework. If you have already graduated, you should have access to all six courses listed below. To visit the Campus, click on the green “Go to Campus” button at the top of the dashboard. From there, you’ll be able to select the content that you’d like to view. 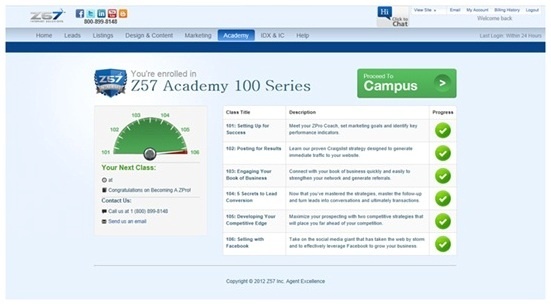 In addition to adding online content, we have restructured the Z57 Academy 100 series training to consist of six 30 minute courses with five follow-up online courses which can now be located on the Campus. Here’s a list of courses with a brief description of each. Please visit the campus to check out the great content! Posting for Results: Get an overview of our proven craigslist strategy and find out how and why craigslist is such a powerful tool in generating exposure, traffic and leads for your business. Engaging Your Book of Business: Find out how to engage your book of business to grow your network and generate referrals using a simple strategy that you can execute in mere minutes a week! 5 Keys to Lead Conversion: This is a NEW class. In order to best provide you with the tools you need to take your marketing from introduction to transaction, we put together a class that offers insight on the best methods to use when following up with leads. Competitive Strategies: Broaden your reach – learn multiple strategies that involve prospecting unique groups with single property websites and other marketing strategies you’ve learned in Z57 Academy. Selling with Facebook: Learn how to leverage the most popular social media website on the internet to connect with prospects, build brand consistency and drive traffic to your website! Branding Your Business For Success: Learn how to simply but effectively brand your business to generate the best success with your marketing efforts in this bonus class. Remember – you always have unlimited free support with Z57. Visit www.Z57.com and select “Click to Chat” at the top of the page, email us at customerservice@Z57.com or give us a call at 800.899.8148.